Paul Newman studies Earth’s stratosphere and, particularly, the ozone layer. 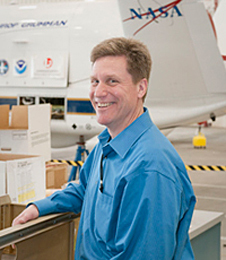 He is a leader in the use of airplanes for atmospheric research, and is a senior scientist in the Atmospheric Chemistry and Dynamics Branch of NASA's Goddard Space Flight Center in Greenbelt, Md. Newman is currently a co-chair of the Scientific Assessment Panel for the Montreal Protocol, the landmark international treaty banning ozone-depleting substances to protect Earth’s ozone layer. A native of Seattle, Newman graduated from that city’s O'Dea High School and earned a bachelor’s degree in physics at Seattle University. He completed his doctorate in physics at Iowa State University. Newman arrived at NASA Goddard in 1984 as a postdoctoral researcher, and then worked for several years as science contractor. He became a civil servant scientist in 1990. Newman has authored or co-authored more than 130 refereed scientific papers and reports, including several significant studies of atmospheric ozone. He helps direct Goddard's analysis of the dynamics, chemistry, and radiative properties of the middle atmosphere. He has participated in or led more than 15 aircraft field campaigns, including work in Costa Rica, Sweden, Norway and Alaska. During the SAGE III Ozone Loss and Validation Experiment (SOLVE), Newman directed the first flight of the NASA ER-2 over Russia, a civilian version of the U-2 reconnaissance plane that was converted to scientific research. Newman is a member of the American Meteorological Society, the American Geophysical Union, the International Ozone Commission (IOC), and other international scientific and technical committees. He has been part of ten NASA Group Achievement awards and has twice been chosen by his Goddard colleagues for peer awards. In 2002, he was chosen for the Arthur S. Flemming Award presented by George Washington University. In 2009, he was awarded a Stratospheric Ozone Protection Award by the Environmental Protection Agency. In 2010, he was named a Fellow of the American Geophysical Union.